Apples to Applique: Testing Signs - Free Printables! Testing season is here! While it is definitely not our favorite time in the world of education, we understand it is a necessary evil tool to measure our students' success...or something like that. 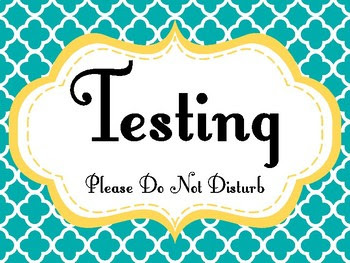 I've got a couple of "testing" sign freebies for you today! While they won't make testing any less monotonous (anyone else resorted to counting ceiling tiles in the classroom?) they will at least be cute hanging on your door. And who doesn't need a little freebie to cheer up their life in this final push through the rest of the school year? First, a "Testing" sign in my most popular classroom decor theme. 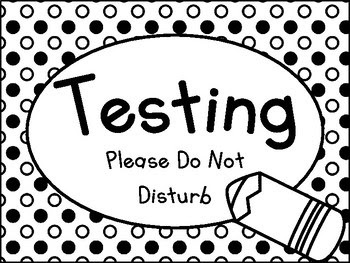 Second, since so many of us are limited to black and white printers at school, a "Testing" sign in a fun black and white theme. May your season of testing be short, and your students' scores high!